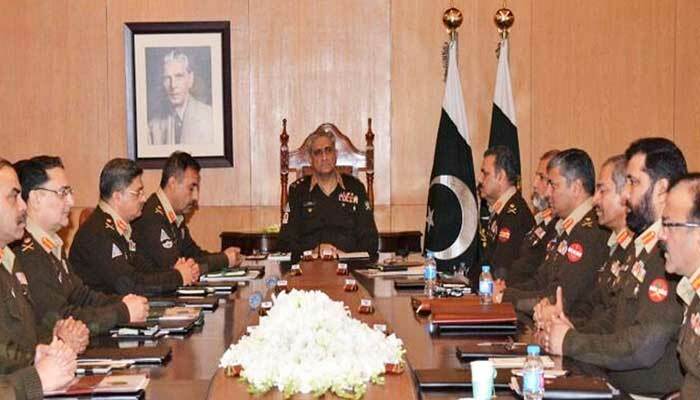 RAWALPINDI: The 217th Corps Commanders Conference, presided over by Chief of the Army Staff (COAS) General Qamar Javed Bajwa at the GHQ on Tuesday, reiterated to continue support efforts for peace in the region and initiatives taken for the purpose. The forum reviewed the geo-strategic environment and security situation of the country. Progress of ongoing operations, fencing along the Pak-Afghan border, situation along the eastern border, including Indian ceasefire violations deliberately targeting innocent citizens, and the Afghan reconciliation process were also discussed, the Inter-Services Public Relations (ISPR) said. The COAS time and again has stressed for peace in Afghanistan, which is also in the interests of a stable Pakistan. It may be pointed out General Austin Scott Miller, Commander Resolute Support Mission in Afghanistan, called on General Qamar Javed Bajwa less than two weeks back to discuss the ongoing Afghan reconciliation process. Both expressed unanimity of views on the importance of political resolution of the Afghan situation and underlined that only an Afghan owned and Afghan-led inclusive process could lead to peace in Afghanistan. They also reaffirmed the need for continuing harmonised efforts against terrorists and for effective border management. The COAS said that Pakistan is committed to efforts for peace in Afghanistan as it is important for peace in Pakistan. The Pakistan Army had also completed fencing on over 700 kilometers out of 2,611-kilometer-long Pak-Afghan border by the end of year 2018.